When Robert Newton retired from La Trobe University, he decided to investigate an extraordinary collection of family papers left to him in the hope that he would do something to tell the stories that lay dormant amongst them. The Mothers is the second of these books. 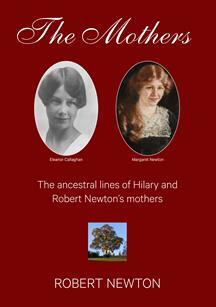 It follows the female lines of his, and his wife Hilary’s, mothers, Eleanor and Margaret. They were two wonderful, kind and generous women. Their two very different stories were joined by Robert and Hilary’s marriage in California 60 years ago. Both are fascinating tales, taking separate paths to arrive at the same place with their children and grandchildren sharing both stories. Their families arrived in Australia around the middle of the 19th century to create many generations of Australians. Namesakes was the first of the books and followed his Newton ancestors from England through its colonies from New Hampshire, Massachusetts, Nova Scotia, Ireland and on to Victoria. Deeds Speak Louder Than Words – Hon. John Crozier M.L.C.